Listen to the interview (approx. 48 min.) or download it. Graduated in 2011 with a degree in Performance. Principal instrument: drums. Position: Associate Teacher (Mathematics, grades 9 – 12) at LEAD Public Schools in Nashville, TN. For this one year Eric teaches full-time while being mentored and taking classes, then at the end of the academic year he receives his teaching certification. 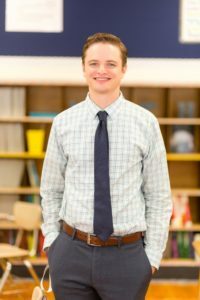 As of this interview (April 2017), he has been hired by the same school he has been working in to be a regular full-time math teacher starting in September. 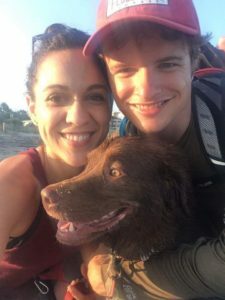 Feeling strongly about social justice, Eric looked for jobs in human services non-profits, then his wife discovered this brand new National Teacher Residency program in which he would get his certification while working. Having enjoyed working with disadvantaged students, Eric thought that teaching would be a great career–and being able to earn rather than spend money in that first year made this program particularly attractive. 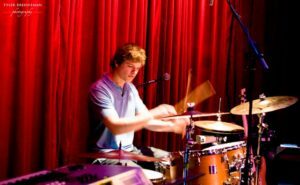 There was an extensive screening process, but the person who was starting the program was from Boston and familiar with Berklee, and figured Eric would succeed. 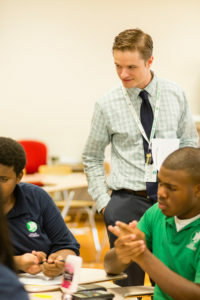 He actually entered the program as an English teacher, but switched over to math, as he found he had more passion for the subject (plus the better job security and lighter grading load don’t hurt either.) Eric has been successful in his program and received the hoped-for job offer from his school just a few weeks before the interview. “For a long time I was intimidated by the thought of not being a musician. I’d been a performance major! As I got older, I realized there was more to life than that. I asked if music was a vehicle to what I wanted in life.” Don’t be afraid to ask those questions and answer honestly.